The fruit on Slotland’s newest online slot machine may be glittering jewels, but the object of MegaSpin is the same as any fruitee and that’s to get three in a row. The new game launched this week joins 15 other unique games at the popular slots and video poker site. Like all of Slotland’s games, it is an instant-play game that requires no downloading or installation -- and it can only be played at Slotland.com. 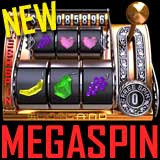 MegaSpin is a single-payline slot machine game with two sets of three-reels. Players start by spinning the bigger reels. If they win, they continue playing on the upper reels where they can multiply their winnings. Hitting three different fruit symbols wins three free spins. Wild Stars are wild and can substitute for other symbols on the payline. Like all of Slotland’s unique slot machines and video poker games, MegaSpin is tied to Slotland’s progressive jackpot which was recently won for $134K and is already approaching $100K again. The progressive bonus pool continually increases as players bet and play until it is won. Three Wild Stars on each of the two reels, while betting maximum, wins the progressive jackpot. Slotland.com now features thirteen unique slot machines and three video poker games. Four of the most popular online slot machines and two video poker games are also available on mobile phones and PDAs. All of Slotland’s games give players the option of placing a maximum bet for a chance at the progressive jackpot. All of the slots and video poker games on the mobile network are also tied to the same jackpot pools. Slotland is available in Spanish at Es.Slotland.com.